Many gardeners and ponders come to the practice with an appreciation for wildlife. Such was the case with us. After many years of providing a haven for birds and other wildlife on our 1 acre, we became aware of the National Wildlife Federation's Backyard Habitat program. We wholeheartedly recommend the program to other gardeners and ponders. 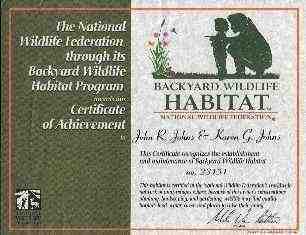 In order to be certified, start with visiting the National wildlife Federation. 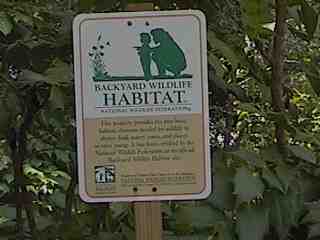 Additional wildlife habitat information is available at Family of Nature Websites.